Britain?s vast network of camera fairs offers a virtual grab bag of kit for photographers from all walks of life. With such a broad range of equipment that appeals to most kit bags, this well-organised system has proven to be a unifying force among both photographers and collectors. Once (and often twice) a month in a school or community centre near you, a group of around 30 traders will set up their tables and spread out their wares. On offer is a substantial collection of cameras, lenses and related accessories, ranging from novelty, professional and vintage, to fresh off the production line . 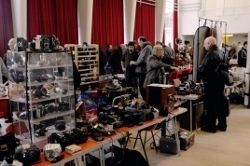 For only a few pounds entry (after about 10am; early bird entries cost more), photography enthusiasts can hunt for bargain lenses, search for long obsolete camera bodies, sell or swap their own equipment, or simply marvel at the collections amassed by many of the dealers. ?People can find anything here: modern second-hand film cameras; lenses; darkroom equipment; even digital kit,? 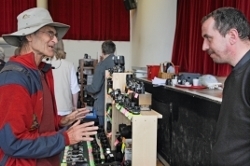 says Peter Loy, a collectible camera specialist with a table at the Sidcup fair in Kent. ?It?s mostly collectibles people are after, but we also get people with modern SLRs who come looking for bargains. ‘Today, I have sold everything from microscope cameras to Leicas, Zeiss lenses and even robot cameras. ‘The price of the equipment varies enormously. You might pay a couple of pounds for some filters or a cheap folding camera, or you might find something unique for £5,000.? 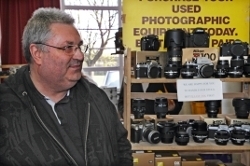 Malcolm Collins recently sold a secondhand Nikon D3 body for £2,200 at a camera fair. This is a fairly atypical sale price at a fair that boasts mostly collectibles, but he says a growing proportion of those who visit fairs now are people looking for modern digital equipment. ? ?but now that you are looking at third, fourth, and in some cases, fifth-generation digital equipment, it is getting easier.? Yet sourcing his goods remains very hard work and requires a lot of driving around the country, he insists. In addition to selling his equipment, camera fairs are a major source for accumulating his wares. Nearly every weekend Malcolm is at a fair either as a buyer, seller or organiser. He stresses at this point the oft-held misconception that camera fairs are akin to car-boot sales. ?You?re not going to get something for nothing, but you will find plenty of quality products at prices much lower than almost everywhere else,? he says. For Peter and Malcolm, as well as many others, their love and knowledge of photography have transformed what was once a hobby into a fully fledged business. ?I?ve been doing this since 1987,? Peter adds, ?and I travel all over the world searching for the equipment I sell, mostly buying people?s collections. It?s my full-time business.? For many of the organisers who keep this vast network running, their endeavours also have their origins in camera clubs and collecting. ?I started doing fairs about 20 years ago,? says Patrick Archer, organiser of the Sidcup fair. ‘I was an early member of a photographic collectors? club, and at that time there were no camera fairs in England. At the club we had a sales room where members would sell or swap cameras, and the idea really grew from there. ‘I started organising fairs because it offered me and others a chance to buy new pieces for our collections. Pretty soon I was the chairman of the southern region?s network of fairs.? 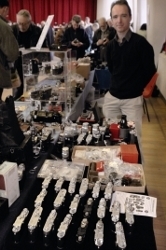 Attendance is growing, says Peter Levinson, who organises 11 fairs a year in Beaconsfield, Buckinghamshire; Guildford, Surrey and Potters Bar, Hertfordshire. Charging £28 for a six-foot table, Peter averages about 40 stalls (which equates to 25-30 stallholders) per fair. This number is fairly static, but he has noticed an upward trend of about 12% each year over the past several years in the number of people who attend. He can now expect up to 200 people. ?About 65% of the public who come do so on a regular basis, but we?re seeing a lot of students, some professionals and even a large number of families coming to the fairs, because they have a small digital compact but want to find a cheap SLR,? says Peter. ?A lot of the new people who come are doing so because of the demise of the high-street camera shop. There?s a big gap in the market. Nothing is as important in photography as seeing and handling the equipment you want to buy. You may see a lens on the internet for £50, but it may have a small imperfection, which you won?t notice until you?ve seen it. Until you hold that lens, that doubt will linger in your mind. This is why I don?t think camera fairs will ever be taken over by the internet.? There?s also the nostalgia factor to consider, says Patrick, who has also noted increases in attendance, particularly since the onset of the economic troubles. ?For many older users, or even those in their 30s or 40s, camera fairs offer them the chance to acquire something they maybe couldn?t afford even just a few years ago?, he says. ?Digital technology has brought that price down. Photographers can now own top-of-the- line equipment such as Hasselblad for a much more reasonable amount of money.? Most importantly, he says, the fairs offer a great day out for anyone with an interest in photography or collecting. Patrick recalls how, around five years ago, the Japanese Ambassador to the UK was a frequent visitor to his fairs. Though he came incognito, Patrick spotted his diplomatic licence plates, and eventually got to know the Ambassador in the canteen, where many fairgoers meet afterwards to discuss their purchases. ?The Ambassador was an avid Nikon collector and extremely knowledgeable,? Patrick recalls. ?This is one of the reasons that camera fairs are so well supported ? the knowledge of those you meet there,? says Peter Levinson. ?In what other trade can merchants and customers talk all day about their stock? A lot of retailing these days is quite clinical, and I?m really proud of the fact that the stallholders are so passionate. It?s what makes the fairs work. ?